1. Download and extract the contents of the .zip file named Cusp Error.zip. 2. Open the extracted folder named Cusp Error. 4. Find the current file path of the nx file in your computer (Right click >> Properties). Copy the file path and paste it in the first line (the highlighted portion in the notepad as shown in Figure 1). 5. Change the version of Siemens NX to the one you are using (module works for Siemens NX 10.0, 11.0, and 12.0) in the third line of the notepad file (as highlighted in Figure 2). 6. Now, double-click nx to launch the Windows Batch File. This will launch the Siemens NX window and a terminal window (you can minimize it or close it – it contains the information you input in steps 4 and 5). 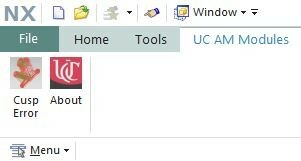 You may notice the UC AM Modules tab in the top toolbar. Click on it. The Cusp Error module will be visible. 8. Once the file is opened in Siemens NX, you can click on Cusp Error button on the Command Ribbon. The button will look like the "Button" image on the right. 9. The Cusp Error GUI is shown in Figure 3. The detailed explanation of each option in the GUI is given below. 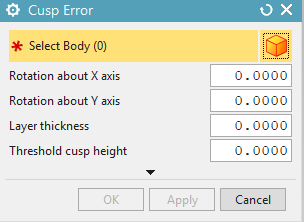 This option is used to select the body for which Cusp Error needs to be calculated. The body will be sliced in to number of layers based on the specified layer thickness. The cusp error made by each facet is compared with the specified threshold cusp height to highlight the facets in green (below threshold) or red (above threshold). The output window of the Cusp Error module is shown below. The results consist of number of facets of the body, cusp error of each facet and the average cusp error. Please watch the video tutorial of the module conducted on an example part given with the module. Use the Parasolid File named Part_1.x_t in the Example Parts folder attached in the Cusp Error module folder that you have extracted from the website. Try out the following input configurations to note the changes in number of facets, cusp error of each facet and the average cusp error. Rotate the part along X axis by 30 degrees and rotate the part along Y axis by 45 degrees Input Layer thickness as 2.00 mm and Set Threshold cusp height as 1.5 mm. 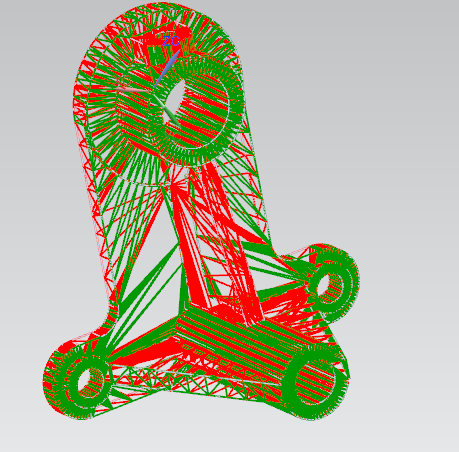 Rotate the part along X axis by 45 degrees and rotate the part along Y axis by 60 degrees Input Layer thickness as 1.00 mm and Set Threshold cusp height as 0.5 mm.